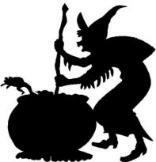 Our Magickal Rosmary herb was organically grown in an authentic "Witch's Garden." Includes large glass jar over 3" tall with a cork top and filled to the brim with Rosemary. The spell and directions for use are included. USES OF ROSEMARY: It is believed to remove negative energy from the home when burned in a censor or metal stone incense container. It has long been used to ward off evil spirits and to keep burglars and others with evil intentions from gaining entrance to your home to harm your family. Mixed with Juniper berries, Rosemary can be burned in a sickroom to promote healing and recovery and to drive out any negativity held within the room of the sick. It is believed to enhance your memory when you take the test at school and to remove nightmares when placed under your pillow. Get medical advice before taking internally. Shipping is free. Our Magickal Lemon Balm was organically grown in an authentic "Witch's Garden." Lemon balm has been used in witches spells to bring happiness and a sense of balance to one�s life. A very old herb, lemon balm has also been used to relieve stress-caused stomach ache and other pains and it is said to prevent depression. Get medical advice before using internally. Includes large glass jar over 3" tall with a cork top and filled to the brim with your herb. Includes a spell and directions for use. Shipping is Free. Our Magickal Pine Needles were taken from a pine tree in an authentic "Witch's Garden." For many centuries pine trees have been called "the sweetest of woods." The Druids referred to this large beautiful tree as one of the seven chieftain trees. Its needles have been utilized to cleanse and purify homes and businesses. If warn in an amulet, it is said to draw money and wealth to the wearer. Get medical advice before using internally.Includes large glass jar over 3" tall with a cork top and filled to the brim with your herb. The spell and directions for use is included. Shipping is Free. This is authentic magickal sage which is organically grown and blessed in a specially prepared "Witch's Garden," with directions and a spell to help you remove hostile and evil forces that wish to harm you. Includes large glass jar over 3" tall with a cork top and filled to the brim with magickal sage. The spell and directions for its use are included. Shipping is free. Includes dried naturally grown cedar herbs (1/2 ounce), sand to protect incense burner bottom, a cleaner brush and free shipping. Use these naturally grown California white sage smudge sticks to cleanse and purify your home or alar area. Removes negative energy. Each bundle has 6 to 8 California white sage sticks which are 5 to 6 inches long. California White Sage for cleansing and purifying your home or altar area and is especially good for removing negative energy. Includes 1/2 ounce of organic dried and sifted sage herbs, sand to protect incense burner bottom, cleaner brush and free shipping. This is an herb especially good to increase protection from harm and improve psychic dreams and clairvoyance and is found to prevent fatigue on long journeys. Mugwort is the most widely used Witch's herb and it is a favorite choice for your altar or to carry it with you. Included is 1/2 ounce of naturally grown organic cut and sifted mugwart herbs. sand to protect incense burner bottom and incense cleaner brush. Free shipping. Naturally grown and dried thyme leaves great for increasing courage and physic strength and can ward off negativity. Use for bathing or burn in an incense burner. Each package comes with 1/2 ounce of herbs, sand to protect bottom of incense burner and cleaner brush. Free shipping.